AUTI9003, a pseudonym on Reddit, posted a photograph which demonstrated arbitrators on the EOS network in action, reversing confirmed transactions. A so-called judge referred verses from the EOS blockchain’s constitution to resolve a dispute between two account holders. The claimant accused an unidentified individual of possessing private keys to its EOS account via a phishing attempt. The user reached out to the EOS with his/her complaint and the network chose one Ben Gates as an arbitrator to resolve it, under the management of another individual called Moti Tabulo. The complaint-to-resolve structure, according to responders, was reminiscent of a conventional customer support model practiced by centralized organizations. Many argued that why a crypto user would find EOS better than any traditional legal system, given its high authority over the network. Whiteblock, a blockchain testing firm, for instance, found that EOS had fewer features of a decentralized blockchain and more that of a cloud computing service. According to them, the protocol lacks immutability, meaning authorities can change or modify data on the EOS blocks with minimal resistance. The AUTI9003 thread likewise offered similar criticism but turned into an EOS-bashing event with some pseudonyms calling the project names. In the midst, an argument came from CarInABoxx also questioning the project over its scalability solutions. “Let’s say that 100 accounts get phished in an attack. Each of them creates a “case” on the EOS portal, each of them present evidence, the other party responds, then the EOS gods come to a decision,” the pseudonym assumed. “Decentralization is not what we are after,” said Daniel Larimer, the creator of the EOS protocol in a YouTube channel interview. The programmer drew a thin line between how a decentralization works and how it gets perceived. He referred to log scales while explaining how projects like Steem, BitShares, and EOS (all his own) are two-three times more decentralized than Bitcoin and Ethereum. The argument, whether its Bitcoin or EOS, remains about the possibility of block producers colluding with each other to govern a blockchain as though they are its masters. That indeed abandons the idea of having a censorship-resistant and stable financial system. Singapore Exchange Limited (SGX), along with the Monetary Authority of Singapore (MAS), have successfully tested the use of blockchain technology for tokenized assets settlement. The report reveals the data on the trial that began in August, shortly after MAS and SGX had partnered with U.S. stock market Nasdaq, “big four” consulting company Deloitte, and Singaporean tech company Anquan. The partners have developed a blockchain-driven solution for Delivery versus Payment (DvP) capabilities — a settlement procedure where the buyer's payment for securities is due at the time of delivery. The trial shows that financial institutions and corporate investors are able to carry out the exchange and final settlement of tokenized assets on different blockchain platforms simultaneously. SGX believes that this could increase operational efficiency and reduce settlement risks. The technology helps automate DvP settlement processes by using smart contracts, the report concludes. In July, local government-owned service provider CrimsonLogic unveiled its cross-border blockchain network for global trade in order to boost the efficiency of trade corridors between China and the Association of Southeast Asian Nations (ASEAN) nations. In October, a major corporation providing electricity and gas transmission in Singapore, SP Group, launched a blockchain-powered renewable energy certificate marketplace to buy and sell solar energy worldwide. A fairly obscure but growing ethereum project called Lition is helping real German citizens find cheaper energy. Launched early this year, Lition is a licensed energy supplier in Germany with clients in 12 major cities (including Berlin, Hamburg and Munich) who are now using its decentralized energy market. Built on top of the ethereum blockchain, the Lition market connects consumers directly with energy producers big and small. More than 700 households across Germany are now using the decentralized platform to buy their energy, according to the company. This means that Lition is trying to change how global energy works with a concept very familiar to blockchain enthusiasts: "bypassing unnecessary middlemen," saving its users money on energy. In the case of the households, an energy supplier sells the solar or electric energy (or whatever type they've produced) to an intermediary, often a giant, multinational company. Customers then buy energy from that intermediary. The problem is, in the eyes of Lition CEO Richard Lohwasser, these multinational intermediaries have too much influence and don't give users enough choice in what type of energy they can buy. So, Lition's solution is to cut them out completely. Slicing out the middlemen also cuts costs – and not by a minuscule amount either. According to Lition, this saves customers an average of 20 percent on their utility bills, and increases power plant revenue by up to 30 percent. That's even though Lition has a strong emphasis on "green energy," which while better for the environment, is often more expensive. Lition users can choose from the categories of wind, solar or biomass, then choose which provider they like the best (which, Lohwasser said is usually just the cheapest option). Once a user finds the energy they want to buy, they make a payment in euros to Lition. Behind the scenes, an ethereum smart contract detects this payment and automatically sends the customer their energy. Initially, around 13,000 Ethereum (ETH) was moved from the address of Pure Bit. Over the last 24 hours, nearly $10 million worth of ETH was moved from Pure Bit’s address. 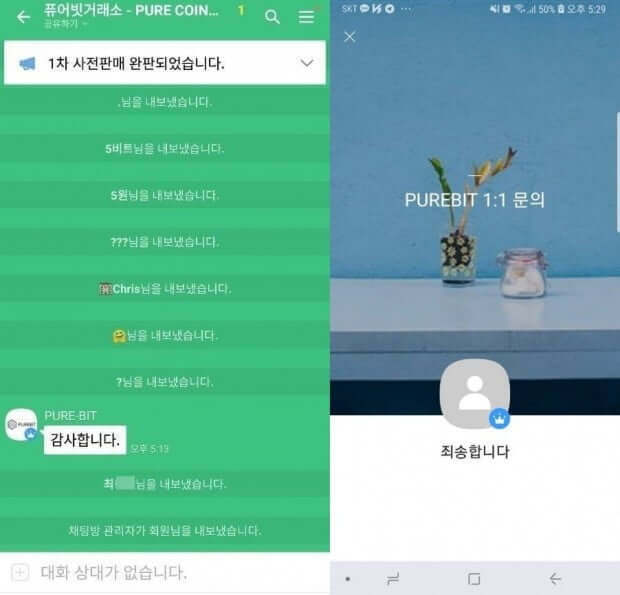 Earlier this year, Pure Bit raised $30 million in an initial coin offering (ICO) to create a cryptocurrency exchange. Within months since its token sale, the team behind the token sale disappeared with all of the funds raised during the ICO.